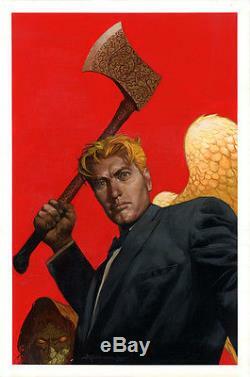 You're looking at an original piece of art by CHRISTOPHER MOELLER, for the painted cover to LUCIFER (based on the character originated in Neil Gaiman's SANDMAN, and the basis of the CW Television show) #35. This is a great, gigantic, painting by Moeller with a fantastic image of Lucifer. Paint on board (20 x 30 inches), excellent condition. All kinds of great artists here. The item "CHRISTOPHER MOELLER Lucifer #35 ORIGINAL PAINTED COVER ART HUGE" is in sale since Monday, August 29, 2016. This item is in the category "Collectibles\Comics\Original Comic Art\Covers". The seller is "chesslove" and is located in New York, New York. This item can be shipped worldwide.